Comparisons between energy efficiency and renewable energy are very different at the customer and utility levels. Work by ACEEE and LBL has found that energy efficiency typically costs an electric utility (or other program administrator) an average of about 3 cents per kWh saved over the lifetime of the efficiency measure (while this is the average, portfolio costs vary among program administrators, in the range of about 1.5-5 cents per kWh, according to the ACEEE study linked above). This amount can be compared to the cost to generate power (e.g., from fossil fuels or renewables) and bring it to a home or business. 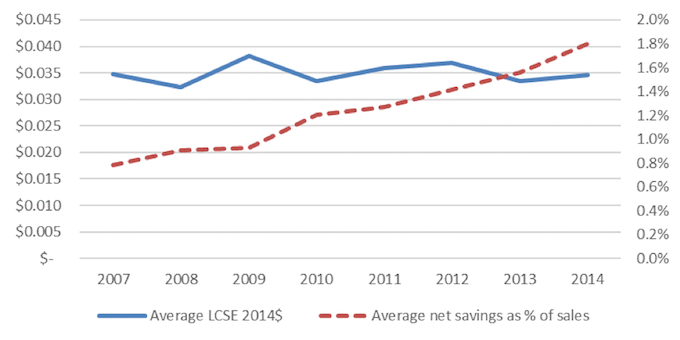 Efficiency’s cost has been surprisingly level in recent years, as shown in the figure below, even with continuing increases in savings. Levelized cost of saved energy for 14 utilities with large efficiency programs. From ACEEE Big Savers. The cost of efficiency to the utility does not include participant costs. When those costs are included, ACEEE and LBL find that the price per kWh roughly doubles to an average of about 6 cents per kWh. This total all-in cost can be compared to the cost of on-site renewables, such as rooftop solar. Renewable energy costs vary by application and have declined over time. To simplify this discussion, let’s look at the lowest unsubsidized cost per an analysis by Lazard Associates. The lowest cost today is likely to be the average cost at some point in the future, and thus by emphasizing the lowest cost today, we implicitly assume some future price declines. First, let’s look at customer costs. Today, the lowest unsubsidized cost for residential rooftop solar is about 18.7 cents per kWh, more than three times the average all-in cost for energy efficiency. Commercial and industrial solar bottoms out at 8.5 cents per kWh and community solar at 7.6 cents per kWh, both of which are more expensive than the average efficiency measure. Next, let’s look at utility costs. For utility-scale renewables, the lowest unsubsidized cost for wind is 3.0 cents per kWh, and the lowest cost for photovoltaics is 4.3 cents per kWh. A few projects have come in with lower costs, but these costs take advantage of federal renewable energy tax credits that are scheduled to phase out over the next few years. These costs can be compared to the 3 cents per kWh average cost of efficiency to the utility that we discussed earlier. It should also be noted that much new generation is fueled by natural gas, and Lazard estimates the levelized cost of new gas combined-cycle turbines at 4.2-7.8 cents per kWh. This is more expensive than average efficiency as well as many centralized wind and solar projects. The cost of utility-scale renewables does not include the cost of transmission and distribution (T&D) upgrades that are sometimes needed to bring power from centralized renewables to homes and businesses. These costs vary widely but can add approximately 2 cents per kWh to the cost of some centralized renewable energy projects and can also increase the benefits of energy efficiency and rooftop solar by roughly the same amount (e.g., Baatz found that avoided T&D costs ranged from $0 to more than $200 per kW-year, with an average cost of about $70 per kW-year; if this capacity is used about 3,000 hours per year — a rough estimate of typical use — then the average avoided T&D cost for efficiency savings or customer-sited renewables is on the order of 2 cents per kWh). In addition, as renewables make up an increasing share of grid power, some energy storage will be needed, which can add costs at the utility or customer level. For example, two utility-scale hybrid solar plus storage projects coming on line this year have levelized costs of 10.8 and 13.9 cents per kWh supplied. McKinsey & Company reports that the overall incremental cost for using storage to firm up wind or solar power can range from 2 to 10 cents per kWh. When average avoided T&D costs and the minimum storage costs are added to the low end of wind and solar costs, the power costs the utility 7-8 cents per kWh, more than double the cost of efficiency to the utility. Because energy efficiency is typically one-third to half the full cost of rooftop solar, it generally makes sense to take efficiency opportunities into account before sizing a rooftop system, reducing the size of the system that needs to be purchased. For example, as I noted in a prior blog post, instead of installing a 5 kW home solar system, efficiency can be used to reduce demand. The result: the home may need only a 3.5 kW system, reducing the investment by $2,500 per home, even after including the cost of the efficiency improvements. Likewise if efficiency is used to reduce total utility system loads, the cost of a grid with a high percentage of renewable generation can be substantially reduced. For example, a recent study by the International Renewable Energy Agency found that pursuing both efficiency and renewables will increase the share of load supplied by renewables (because total loads are reduced) and reduce system costs and carbon emissions relative to both business-as-usual and renewable-only scenarios. However not all efficiency costs the utility 3 cents per kWh or has a total cost of about 6 cents per kWh. Some programs cost more. For example, LBL found that whole-home and low-income weatherization programs cost utilities an average of 15 cents per kWh saved. These programs may be more expensive than renewables, and thus program implementers should look for ways to reduce these costs or find other sources of funds to complement utility funding for such programs. For example the Bronx Healthy Buildings program combines weatherization and health funds to make weatherization and other improvements to multifamily buildings with high incidences of asthma-related emergency room visits and hospital admissions. For the United States to minimize long-term energy costs and meet greenhouse gas emission reduction goals, both energy efficiency and renewable energy will need to play a substantial role. Efficiency can reduce loads at both the household and grid levels, and renewables can provide much of the remaining needed power. As we noted in an earlier blog post, energy efficiency and renewable energy are like peanut butter and jelly — it’s hard to imagine one without the other.